The firm architectsAlliance, led by Peter Clewes, wants to consider the notion of flexible architecture for reinvigorating the suburbs. Right now, the site at 80 Overlea Blvd. isn’t doing much for the city. It’s got a one-storey industrial building, where only a few people currently work, and a big parking lot. The firm architectsAlliance imagines something else: A skinny building four storeys tall, with high ceilings. Downstairs, there’s a wine bar, or maybe a café, or a furniture maker’s workshop. Upstairs, a designer’s office, or an accountant, or an apartment. This mixed urbanism would bring more life to this street in suburban Thorncliffe Park. 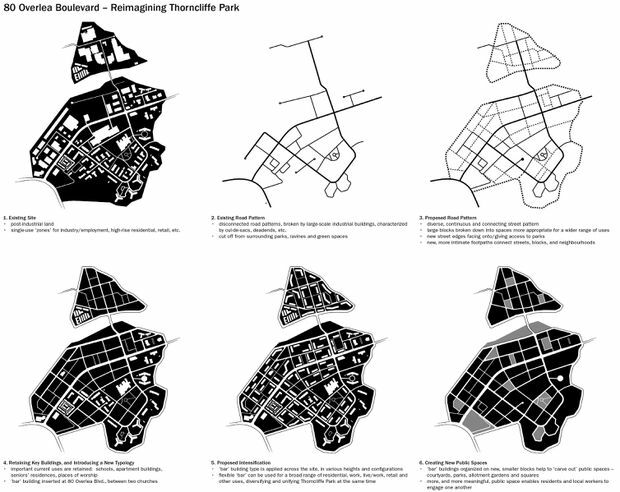 That’s the argument from architectsAlliance, who created this scheme for an continuing Globe series that explores planning in Toronto with the aim of allowing more housing and better neighbourhoods. Small-scale, close together and mixed-use: This is a novel vision of the postwar suburb that draws on the lessons of the past. Mr. Clewes and his colleagues are busy and skilled architects of condos and mixed-use developments, mostly in the affluent downtown. But architectAlliance’s proposal takes aim, instead, at small-scale mixed-use on a suburban road. Specifically at 80 Overlea Blvd., which is now owned by one of their clients. 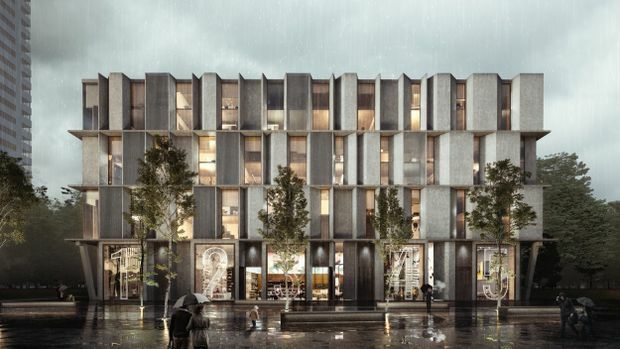 The firm architectsAlliance's proposal aims to create a cityscape with mixed-use, with small units in small buildings that are inherently adaptable. This will bend a lot of rules. For now, the city’s official plan, the main policy document for land use, says areas such as this should “accommodate substantial growth in jobs and meet the needs of … key economic clusters.” They’re off-limits for any sort of residential use, on the theory that many “employment uses” require “buffering.” In other words, workplaces are bad neighbours. That logic goes back to the 1950s and 1960s, when jobs mostly meant industry, and industry meant smokestacks and lathes and abattoirs. The idea of “separation of uses” became a dogma for planners. Who wants to live next to a stamping machine or a killing floor? 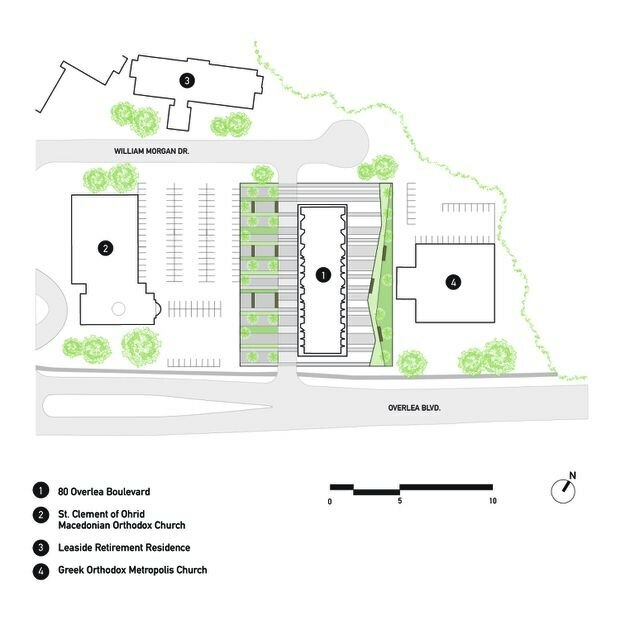 Site plan designed by the firm architectsAlliance. But Mr. Clewes makes an excellent point: Today, Toronto has lots of workplaces that do make good neighbours. Offices. Studios. Even old-fashioned warehousing and light industry, which still sit alongside people’s homes in some parts of the city. Look at Geary Avenue, near Dupont and Dufferin. Its narrow streets were first built up before the advent of land-use planning in Toronto. And today, restaurants and an event space jostle with body shops, plumbing suppliers, offices and – yes – houses. Jane Jacobs would have approved. It’s alive. City planners aren’t likely to embrace the idea. They like clear rules. As The Globe’s Shane Dingman reported last fall, the city is worried about the loss of employment lands as developers seek to build housing on them. Planners assume that housing displaces jobs. Even if that’s true, the city of Toronto has more than 8,000 hectares – that’s an incredible 80 square kilometres – of land that’s strictly regulated in this way. What if 2 per cent of that, or 5 per cent, became a test area for some kind of looser zoning? Another question. What if, by allowing jobs and some limited portion of housing, you opened the door to more growth? And gave people more freedom about how and where to live and work? The obvious point of comparison is the Two Kings, the 1990s loosening of zoning rules along King Street West and King Street East, on the shoulders of downtown. These areas had been zoned for industry, and they were moribund. The city of Toronto’s former chief planner, Paul Bedford, and others chose to loosen up the rules. “The conclusion was, ‘Industry’s never coming back, so let’s just get over it and plan for the future,'” Mr. Clewes says in summary. And look what happened. King West, arguably the least planned area in the city over the past 20 years, is also the busiest and the most prosperous. Tens of thousands of condo and rental apartments have been built or are in the works, and thousands of jobs are following in new purpose-built office towers. It’s a success beyond the wildest dreams of anybody involved.